"Imagine it... The Victorian Age accelerated. Starships and missiles fueled by coal and driven by steam. Leaving history devastated in its wake." — The Doctor, Doctor Who, "Tooth and Claw"
What is Steampunk? It is a retro-style Speculative Fiction set in periods where steam power is king. Very often this will be in an Alternate Universe where the internal combustion engine never displaced the steam engine, and as a result all manner of cool steam-driven technologies have emerged, ranging from Airships to submarines; the plausible counterpart to magitek, with a Hollywood Science Hand Wave or The Spark of Genius. Largely, steampunk runs on Rule of Cool, with some supposedly "steam-powered" technology being more advanced than modern electronics. Sometimes combined with the work of Charles Babbage on mechanical computers to produce a kind of retro cyberpunk set entirely in the Victorian era or a close analogue, with Dickensian exploitation. Steampunk may be a modern reflection of the 1930s40s trope of The Gay '90s, an idealized version of the 1890s. While various works may be more chronologically specific, any time from around 1860, through to the 1910's, can be considered fair game. Think of The American Civil War and World War I as acceptable bookends: the former is when the technological revolution really started to take off, and the latter when it first started edging into Diesel Punk. (Some definitions set the start date earlier, though, perhaps as far back as the 1780s, when the Industrial Revolution first began to take off.) The term "steampunk" was coined by K. W. Jeter to describe the speculative fiction stories in a Victorian setting that he, Tim Powers, and James Blaylock were writing in the early 1980s in contrast to the cyberpunk stories like Neuromancer that were saturating media. 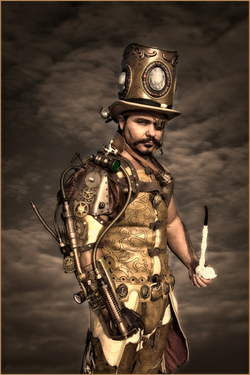 Steampunk's modern incarnation may be considered a reaction to the popular dystopias of that time: the positive power of the imagination and subversion of the New Technology Is Evil trope are common steampunk themes, although recent steampunk is increasingly likely to deal with dystopian societies, sometimes even drawing upon the works of Charles Babbage to theorize humans with mechanical brains and other things rendering them cyberpunk in all but backdrop and visual trappings. Elements of steampunk that are set in the American frontier are usually referred to as "cattlepunk". Some writers and fans refer to the "shiny happy" version as "Victorian Fantasy", "Gaslamp Fantasy" or "Victorian Futurism". Supernatural or paranormal tropes are more frequently included in this approach, in which case the Encyclopedia of Fantasy favours "Gaslight Romance". The more Victorian branch of steampunk sometimes also incorporates vaguely Lovecraftian elements, as shown here . Another good example of the Lovecraftian/antediluvian influence on steampunk would be the design of the Nautilus, Captain Nemo's submarine, in the film adaptation of The League of Extraordinary Gentlemen. Expect to also see a strong, visible Irish influence, in terms of such features as stained wood, brass, and American frontier-style blown glass oil lamps. You will occasionally encounter some minor overlap with the post-Victorian Art Deco movement as well, particularly in terms of typography. The Zeppelin or rigid airship could also be considered one of the major icons of steampunk, due to the major public enthusiasm for the craft pre-1937. This is despite them being much more commonplace in the Diesel Punk era. To be fair, though, the first airship flew in 1852, predating both the Lincoln Administration and radio- and yes, it was powered by a steam engine. Jules Verne, the first Speculative Fiction writer, is the king of this trope. He and H. G. Wells are often mentioned as the foundation of a literary steampunk's reading list. For added style, however, knowledge of the New Thought movement can help, as can Spiritualism, as both of those were very popular among the Victorians, and very influential on their thinking. In addition to being a science fiction writer, Jules Verne was also a Naturalist. The steampunk Naturalist, as exemplified by Verne and others such as William Beebe, is one of steampunk's most important subtropes. Of course, the difference in values between the Victorian era and the present are rarely mentioned, unless the work is emphasizing the "punk" side of things more than most of them do, or consciously attempting Deconstruction. This leads to occasional criticisms that steampunks are glamorising the racist, imperialist culture of the Victorian era — though some of them can and will argue with that. However, any Victorian-era society which actually tried to create steampunk technology would soon find itself in stark trouble. Barring magical intervention, the power requirements necessary to make real-world versions of steampunk devices (or at least Victorian-era versions of 20th century technology) would be enormous, and would soon exhaust all available supplies of coal and wood. A real steampunk society would have to either immediately transform into a fully modern society (with oil, gas, and nuclear power driving devices made of modern, lighter materials) or would quickly become, in all probability, a technological dead end. With this said, the recent development of a number of designs of rocket stoves beginning in the 1980s, have demonstrated that a highly fuel efficient steam boiler may in fact not be quite so impractical after all, at least on a small scale. On this point, it is also worth mentioning that the average contemporary power station still runs primarily on large coal-fired steam turbines, and that nuclear power still actually involves running a steam turbine as well, but simply uses the heat from (ideally) contained nuclear reactions to generate steam, rather than a wood or coal-fed fire. To a large extent, it seems that the fantasy genre is quickly moving away from traditional medieval Heroic Fantasy settings and more towards settings inspired by steampunk. Some modern fantasy authors even combine the two. As noted above, steampunk is not to be confused with Goth, although the two subcultures do share a similar fashion sense and there is some crossover. It should also be noted that steampunk is not rooted in the Punk subculture. Compare Cyberpunk, which has some similarities with steampunk, Tesla Tech Timeline, the result of moving one step further up the industrial scale, past the steam and gears and into steel and electricity, and Raygun Gothic, the aesthetic of SF from the the immediate post-steam era. Compare also Low Culture, High Tech, especially if the story takes place in a real-life historical period. Also compare Zeerust. For a list of tropes common to steampunk, check out the Steampunk Index. Oh, and glueing some gears on it doesn't make it steampunk. As far as hardware hacking or Makerism specifically are concerned, (as opposed to the purely fictional stuff) the steampunk aesthetic exists on the basis of the idea that something looks good because it is good; i.e., a thing's image is an outgrowth of its (effective) fundamental design. This can be achieved in practice, by adhering to a proven engineering tradition, such as the UNIX design philosophy . This video may also help to explain further. There is also a steampunk genre of music (see Music, below), an element of cosplay, and the intersection with the Maker movement as described above (with designers such as Jake von Slatt receiving some mainstream attention). The Other Wiki also has an article about steampunk as well. In this commercial for the California Lottery, a man is being asked about his dog just as he wins the Lotto. He and his dog transform into steampunks, and fly away in a hot air balloon airship. "His name... is Cornelius! And he invented long division!" In this commercial for Intel Ultrabook, a woman uses one of the laptops in a London Metro station. As she closes it and it converts to a tablet, the scene around her transforms into a Victorian train station and as a steam engine pulls into the station, a curious Victorian crowd gathers. Chimney Sweep: Is it powered by coal and steam? Woman: No... it's powered by Intel. This coffee commercial has a steampunk dirigible which launches pumpkin spice flavoring into a woman's coffee. In this Coca-Cola ad , a giant steam-driven steampunk machine creates a few ice cubes so an aristocrat can enjoy a glass of Coke. This commercial shows robots evolving - including a steam-driven T-Rex. This commercial from Italian liqueur maker Amaro Lucano plays whimsically with the steampunk trope. White tie party goers in 1894 engage in such modern pastimes as texting (with portable telegraph keys), selfies (with a folding plate camera on a selfie stick), and scratching (a DJ using two Victrola phonographs). Forbidden Desert, a cooperative game based on the crew and passengers of a crashed airship trying to repair their ship and escape the title desert. The crews of the HMS Chronabelle , HMS Amaranth and MHS Hysteria (led by Captains Mouse, Vincent M. Dantes and Edward Von Arkham, respectively) are but three of the crews of dirigible aviators sailing the skies between their hometowns and conventions. Also Captain Z and the crew of the Hatefish (a Nautilus-like submarine). The trope of the Airship Pirate has become so overwhelmingly prevalent and predictable that a group of fans rebelled against it by forming the Imperial Anti-Piracy Squadron or IAPS, a delightfully intimidating group who entertain and educate about developing costumes and personae whenever they're not showing off flashy uniforms and shouting in pseudo-Austrian accents. Perhaps the most famous is his robotic arm, worn by G. D. Falksen in an iconic photo and by Nathan Fillion in an episode of Castle. Most recently, Willeford created a steampunk Iron Man suit, calling it "Iron Man 1889". It won top honors in the Marvel Cosplay contest at the 2014 San Diego Comic Con. In the NCIS fanfic Shards to a Whole , Tim and Abby decide to go with a steampunk-themed wedding. When Tim explains the concept to the others, Tony is initially less than impressed, since he thinks Wild Wild West is one of the worst movies made in the last twenty years. Tim gives the others a primer in steampunk aesthetic, using the Firefly episode "Shindig" as a visual aid. An Alternate Universe My Little Pony: Friendship Is Magic fic, The Mare Who Once Lived On The Moon, takes place in such a place; the first four sentences are "Lacquered wood. Polished brass. Vented steam. These three things represented the pinnacle of the modern era, an era that shaped and defined Twilight Sparkle's library." Notably, in this fic, the canon magic is significantly nerfed; Twilight's still one of the most powerful unicorns around, in that she can exert as much force with magic as she can with her own four legs. Almost. See this blog for a very good steampunk rendition of Star Wars. There is an excellent "silent movie" parody of Star Trek — Steam Trek: The Moving Picture. In Space, No-one Can Hear You... At All! The Harry Potter fanfic Rebuilt takes place in an Alternate Universe steampunk setting. Pro Pinball: Fantastic Journey is one big love letter to steampunk and Jules Verne, with Professor Steam and his player-assistant building various steam-powered Contraptions to stop the evil General Yagov. As is Tesla, as the whole thing is made to look like what a modern-style pinball machine might have looked like if Nikola Tesla built one. Becky Lynch has an outfit and entrance that is very inspired by steam punk. She wears a pair of goggles as accessories, and a blast of steam comes up from the entrance aisle when her music plays. Wicked: The Musical has the Clock of the Time Dragon, which is part steampunk and part Clock Punk; the Japanese version cranked it up to ten on the steampunk scale. The Mrs Hawking play series, in as much as it is more fantastical than your straight-up Victorian historical fiction. Mrs. Hawking's abilities are somewhat exaggerated beyond what a real human would be able to do, perhaps to the point of superheroism. Following the 198-something revamp of Disneyland California, Tomorrowland was whole-heartedly turned into this, described as something "straight out of Jules Verne's works." Walt Disney World's Tomorrowland followed suit in the early '90s. Also, the Tomorrowland in Disneyland Paris still is something "straight out of Jules Verne's works." Tokyo Disneysea has a VERY steampunk section known as the Mysterious Island, also based on the works of Jules Verne. Alton Towers, a popular English theme park, has lots of steampunk influences, mainly focusing on the theme of Victorian travel and discovery. One in-park hotel is steampunk themed, complete with a giant airship and pith-hated gent in the lobby, and one of the park monorails is painted to appear as a locomotive carriage, full of exotic contraptions and the like. The CityWalk restaurant, Toothsome Chocolate Emporium is more-or-less a steampunk goldmine, being themed as a 19th century chocolate factory that carries a very Jules Verne-style to it. Fans of Halloween Horror Nights nerdgasmed when they discovered that one of the scarezones in 2010 was Saws n' Steam; fissures opening in the ground cause the oceans to dry up, forcing the homicidal citizens of New Yorkshire to take up steam-powered chainsaws and carve up passerby to extract the water from their bodies. The zone notably features a MASSIVE amount of fog in a small alley, as well as chainsaw-wielding maniacs with goggles and leather on each end and a stage with a steampunk police officer monologuing about how they plan on rebuilding their city; one section of the stage has a tank full of body parts that occasionally fires streams of water at the crowd. Said scarezone was so popular that the next year, a haunted house tie in was made. Saws n' Steam: Into The Machine actually brings the audience into one of the processing plants, though most of the steampunk design was lost in favor of a more traditional Industrial Revolution aesthetic (except for the facade and costumes). Also from Horror Nights was a scarezone in 2015 called Scary Tales - Screampunk, which featured twisted fairy tales in a steampunk setting. Parc Astérix in France has L'Oxygenarium. Its backstory is that an inventor named Ferdinand de Teffélé has created in 1900 a machine to purify air. Monster High has Robecca Steam, a robot daughter of a mad scientist. Her fashion style is somewhat outdated, but because it evokes steampunk aesthetics, it is quite chic. Mixels has the Klinkers, a tribe of mechanical-based Mixels. They're old-fashioned and out of date, yet claimed to be "captains of industry" back in their heyday. Their figures use the gear pieces very heavily. Engine Machines from Shikkoku no Sharnoth are some weird form of technology that has granted Victorian England technology on par or superior to our own in many ways, especially militarily. Code:Realize takes place in an alternate Victorian era in which steam technology has significantly advanced due to the invention of the "NeoSteam engine," which greatly improves upon the power and efficiency of steam engines. Detective Hank And The Golden Sneeze has a couple of very steampunky moments, including a steampunk... mobile phone. Sillof's Workshop . Features (among other things) steampunk versions of The Avengers, the Justice League, and the entire cast of the original Star Wars trilogy. There are some brilliant fan-created steampunk lego models out there. Subeta has a month-long celebration of steampunk for its forum members/roleplayers in the spring, called the Atebus Revolution Masquerade. Valenth , a related website created by the same people, is entirely based around steampunk technologies. The Neverwas Haul is probably one of the most impressive bits of steampunk art ever created. A steampunk "mobile home" made from 75% recycled equipment and materials, the Neverwas Haul is basically a three-story Victorian mansion on wheels. Steampunk and its general fanbase have been affectionately parodied on a Fun T-Shirt (which borrowed a line from Jess Nevins): "steampunk: What happens when goths discover brown." A good discussion of the genre was done here in What IS Steampunk? by The United Federation of Charles.